Photo Taken From Driver's Vantage Point in Car on Westwood Blvd. at Intersection With National Blvd. 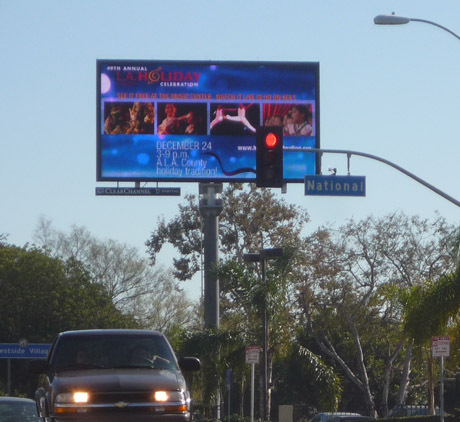 On Nov. 12 of last year, an engineer with the Los Angeles Department of Transportation (LADOT) paid a visit to the site of a digital billboard at Westwood and National Boulevards, in response to a request from an aide to a city councilman who had gotten complaints from constitutents about the billboard posing a potential traffic hazard. After driving to the site, the engineer, Mo Blorfroshan, sent the following e-mail to Jay Greenstein, a field deputy for then-Councilman Jack Weiss. I drove to this location last night around 5:30 PM and the digital billboard at the southwest corner of this intersection is definitely a distraction to southbound motorists on Westwood Bl. As a driver sitting at the north leg of this intersection, the digital billboard is right at the background of the your view of the traffic signals for southbound traffic. I am not sure but this billboard may also be viewed from 10 Fwy. How did this billboard get approved? The Clear Channel billboard is operating today, changing copy every eight seconds as drivers approach and pedestrians cross the busy intersection. And Mr. Borfroshan’s question–“How did this billboard get approved?”–might be replaced by another: Why is it still there?? ?